Guilds of Ravnica has only deepened the online arguments between people who play Urzatron decks in Modern and people who don’t. In fact, it seems to have reached the point of both sides saying no more than one word at a time to each other, and that one word usually being a four-letter one. That has a lot to do with cards like Unmoored Ego, which seem to be planted for the express purpose of being sideboarded against specific Modern decks. This card seems to work against pretty much any deck that isn’t blazingly fast: it even hits lands, unlike Memoricide and Cranial Extraction from years past. Requiring both blue and black is not a huge deal in blocks like Ravnica or formats with fetchlands, and the opponent possibly getting to draw extra cards is not much consolation when they’re a combo deck that depends on specific cards. Lost Legacy, the sequel. Sorta! Lost Legacy’s main advantage was that it was only three mana for what is historically a four mana effect, which is a big deal! Unmoored Ego is an improvement over it in most ways, save for asking for two colors of mana. 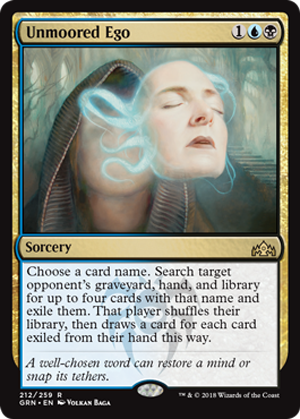 This is definitely a card that functions well in a sideboard to get rid of “silver bullets” and also to get information on what you are playing against. One notable upgrade here is that it can hit lands. Even basic lands, hence the “up to four” wording on the card. If you know a deck splashes for a color, stripping away all of their mana for that splash is a solid approach.